Being binge crafter, I’ve been on a relatively constant spinning kick this week, meaning I hardly made progress on most of my knitting projects. That’s not to say everything’s been stagnant here. I’ve finally finished spinning up the batch of wool that I’d gotten when I went out to Whidbey Island in August. I went out there with the intent of just hiking Deception Pass and spending the weekend out there, but the first night I encountered an absolutely lovely craft store in the city of Oak Harbor (where I stayed) where they sold only local fibers, yarns, etc. Moreover, this was an amazing place that had its own workshop where one could dye or spin their wool (among other things) as well. If only I lived closer to this place. Now deception might be somewhat of a harsh name to give such a lovely fiber and yarn, but I feel that the colors, spinning & plying methods, and place and meaning of the fibers acquired have warranted such a name. It’s exactly what I think of when I see this yarn, for literal and more personal reasons. I have no idea what the different fibers are within this yarn and the colors vary greatly. Funny enough, upon first glance, it appears to be an aqua, teal flavored yarn. But upon further examination, you can see the variety in fibers really well. And I really do believe the variety gives the yarn an amazing flavor, though it has yet to be knitted up so I’ll keep that in mind. I’m extremely proud of the thoughts behind this yarn. Being immersed in thoughtful architecture has led me to search for a greater meaning behind every life decision, menial and major. Menial as it may seem, the meaning behind this wool makes spinning and (soon to be) knitting it so much more meaningful and enjoyable. I look at the yarn today and a wave of various feelings comes with a bundle of simple twisted fiber; I can see the twists and turns of life spun into this fiber. More than just memories come with this fiber; emotions and nostalgia of that time in life. I never really realized why the prospect of spinning and processing my own wool was so important to me. But after spending some time and thinking through all of the meaning and the ideas behind starting something from the very beginnings, it makes me realize how much each step of life can intrigue me. Knowing and learning about so many different stages in life and other forms of development such as design is absolutely fascinating and just constantly leaves me wanting more. I’m sure everyone has their medium for intrigue…any thoughts? The ominous melody of frogs has been following me lately. Such a lovely sound, especially when mixed with the harmony of failure. That goal I set last week to finish the blanket? Fail. But I guess that’s why I make goal to begin with; if I didn’t have any goals then I wouldn’t really get anywhere. If I have them, at least I achieve…something. At least when it comes to knitting. I know for a fact that I rarely ever meet a knitting goal. Or at even any crafting goal to say the least. then it’s time for a headband. Though one of my new years resolutions (like so many other knitters out there) was to not buy yarn for myself, I found that none of the yarn in my bin fit the criteria for my pre-imagined headband. Therefore, in keeping with my mission to visit possibly every LYS in the greater Seattle area, I ventured off to the Fiber Gallery. However, this is not the last time I shall be going there. I loved my first trip there, it’s easily accessible by a bus line near my apartment, and the selection was awesome. I loved the variety of materials there. However, no spinning things (at least I didn’t see any). And on top of that, I ordered some wool to mix in to pick up Project Sheep to Sweater once again. I’ll hopefully be dyeing some wool in the very near future. Anyway, back to the headband. (Geez, I really do go off onto tangents all the gosh darn time!) I feel that any physical activity that warrants heat transmission from the head should go together with a headband. Hats are just too hot after running for a while, plus they always seem to fall off super easily. Moreover, they take so much more yarn than a headband and restrict your line of sight. The beauty of a headband allows your head to breathe while keeping your ears attached to your head. Quite nice, really. Unfortunately, despite such a simple product, I’ve frogged twice already due to the size. First was the ribbing; it was much to thick. Then it was too wide and didn’t fit me (well enough). I’m on my third try…third time’s a charm? Despite my lack of loyalty to the blanket, I have made plenty of progress on the Inishmore legwarmers and I’m about an inch of ribbing away from being completely finished! Win!! I’ll take pictures of the FO once it’s done tonight, to be posted later. I’ve also made some progress (minimal) on Awry, one of the sleeves. I’ve forgotten how boring/tedious/fun (yeah, I know contradicting each other) this project can be due to the yarn, but constant stockinette. Hopefully that’ll be done by…March?? Pressing on with the headband. Stay warm everyone! Let’s hope Seattle remains blue for the next couple days/weeks? Two Christmas projects stand between me and birthday project time, one a knitting project and one a tatting project. While I had originally thought tatting would be a nice quick project but it’s definitely taking a lot longer than planned. The visible progress is rather satisfying; unfortunately it’s so tedious with the same motion over and over again that I need knitting to give it a break. But I’m still enjoying both the tatting and the various WIPs that are getting done that I feel like I have finally reached a productive balance with progressing on Awry, the blanket, and the two projects. Since the recipient of the knitting project has not only known about the project since its inception having chosen it, but she has seen it in progress as well which leaves me free to discuss it on the web openly. There’s something about giving hand-knit gifts that compels me to reveal it to the person early on in the process so as to ensure quality over the surprise. Of course, when it comes to hats and scarves, surprises are great since size really doesn’t matter quite as much. 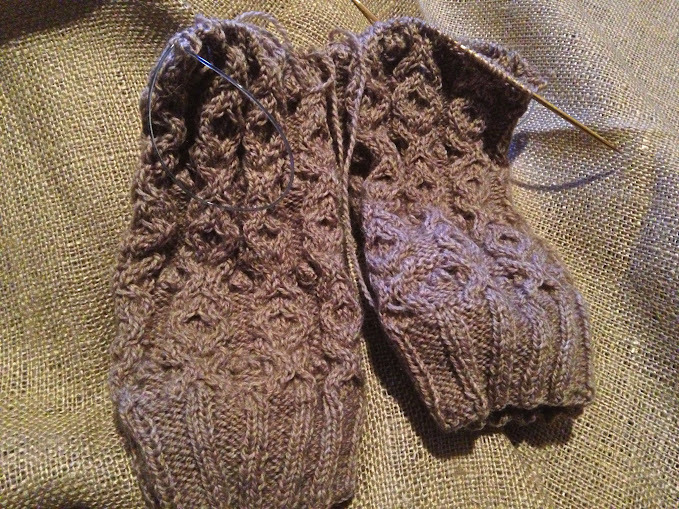 But these legwarmers I’m knitting for one of my cousins had to be carefully measured. One might ask why the size of legwarmers matters. For the average female, it shouldn’t matter that much; however some might be cursed with the calves that we find too large to fit in many long socks, skinny jeans, and legwarmers. This is where my knitting skillz comes in. I was able to take a pattern found in Interweave Holiday and make these Inishmore legwarmers while customizing the size to make them fit well over our calves. They’re a ton of fun to knit and the cable pattern is incredibly easy to remember. I had always seen those little bobble thingies (I’ll just call them bobbles) and never really knew how to knit those. Lo and behold, they’re tons of fun to do and are pretty cute accents. I also learned how to knit backwards while doing this because I simply got tired of turning them back and forth. Moreover, a great suggestion by one of the ladies at Weaving Works, I put the yarn inside the legwarmers as I knit (since I chose to employ the two at a time method) and the yarn no longer gets twisted! I love how they’ve just knit themselves up. I’m using a Cascade 220 in sport weight and I think they’re going to be awesome! Plus, I’ll make sure to block them. Speaking of the bobbles, that leads me to think about the learning curve. I think one reason why I’m so enamored by artwork and crafty hobbies is the infinite abyss that one can delve into. But the capability to simply skim the surface also exists, without skimping on one’s education. This way, the option to delve in and become obsessed about something (such as fiber arts for me) or to simply toe the water of another art is present for me to try absolutely everything. I mean, I’ve been knitting for almost ten years, and though I’ve only become relatively serious in the past 4-ish years, I’m still constantly learning new techniques and understanding new methods. I think the feeling of accomplishment that I have from learning everything myself makes this so much more exciting. How do you prefer to learn? What intrigues you about the possibility of new ideas, skills, and hobbies? I shall leave you with Bonnie, an adorable terrier mix. 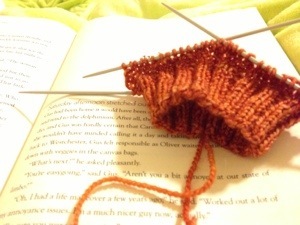 There really is no better way to unwind from a day than to sit and knit and read a good novel. Rather than use brainpower, it Allows me such a nice release from the various demanding energies throughout the day and simply an outlet to float off to distant lands. Sure my evening was spent knitting but my focus was split between teaching knitting and the election; not very relaxing if you ask me! I’m currently working on some Cadence Socks (ravelry link to be posted later) in some Madelinetosh I acquired this weekend on a whim. I can definitely see what all the buzz on Madelinetosh is; too bad I can’t use it for every project! I know I’ve been absent for quite some time and I’m sure there’s no good excuse. By at least I’ve been doing some knitting? During my week in Hawaii (for spring break), I was extremely adamant about my mission to purchase Hawaiian yarn. Well, picturing a tropical scenery and yarn don’t exactly go hand in hand but I found a yarn store nonetheless (well two, I didn’t get to go to the other one, sadly. Plus my budget wouldn’t allow it.) I walked all the way down King Street in my quest for yarn and spent a nice chunk of time (probably 2 hours-ish) simply talking to the shop owner. She was a lovely lady (though I did not catch her name) and we conversed extensively about spinning, knitting, and other fiber components. While there was only one type of yarn that was locally dyed in Hawaii (which I acquired and failed to take pictures of; those will come) there was some roving that I had purchased from some sheep off of another island. Acquired both. Anyway, a lovely little shop very interestingly organized on the shelf and might have been the size of two of my bedrooms. If I could, I would have loved to go there and knit for an afternoon. Unfortunately, I have yet to do that even in my hometown.